Gluten-free products are all the rage these days, due to both the inability to tolerate gluten or the perceived health benefits. For several years, I have been experimenting with gluten-free baking for my dad, who cannot eat gluten. Many of my first attempts landed in the trash can. But after much trial and error, I have developed a flour blend that works in muffins, quick breads, cakes, etc. In a daring moment, I even made a batch of pizza dough and grilled it. In this case, there was a difference compared to the wheat flour version, but it really worked and was a treat to someone who typically has to pass on the pizza. As someone who tries to limit her gluten intake but does eat some, I truly believe there are many delicious foods that are naturally gluten free. But, sometimes, you just want your favorite cookie or birthday cake! This blend makes it possible to enjoy old favorites, even if you are eating in a new way. As a side note, a reader recently emailed me and said that her mother won a recipe contest using this gluten-free mix. Interestingly, she won in the regular baking category, not the gluten-free category. I thought that was pretty great! Perhaps I will make and share the prize-winning recipe soon. In the meantime, here is a link to my gluten-free father’s all-time favorite recipe using this mix…my grandmother’s apple cake! While there are many worthy options, I use Bob’s Red Mill products for this mix. 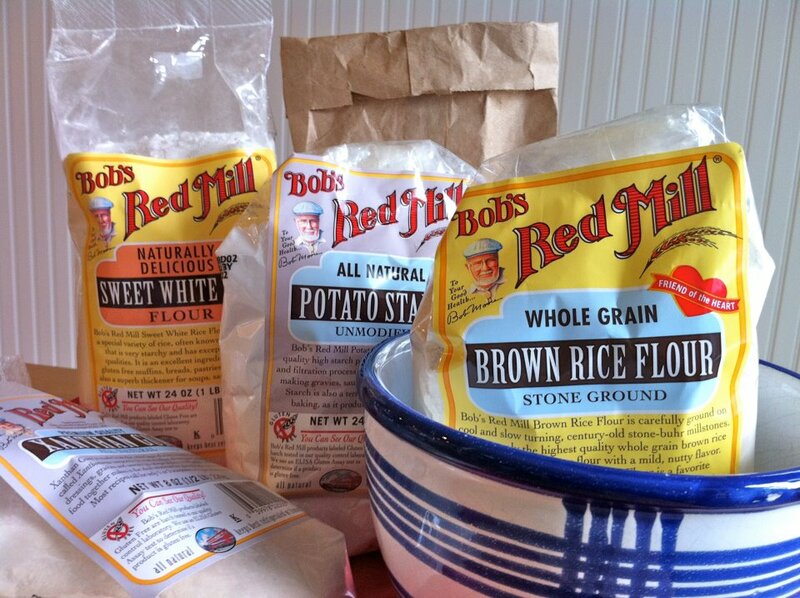 Importantly, I have heard that quality is lacking in some brands of xanthan gum, so I do highly recommend Bob’s Red Mill or another reputable brand for this product. Only a small amount is required, but it is integral to the recipe. Mix all ingredients and store in a large zip-top bag. If you bake gluten free regularly, consider doubling the recipe. Use cup for cup as you would wheat flour. Most of the baked products I post are items that I have cooked both the traditional and gluten-free way with much success. I started out making this mix with all white rice flour. Now, I often use half white and half brown rice flour for the added whole grains. My favorite combination, however, in order to balance the benefit of whole grains with quality of the baked good, is a mix of two cups white rice flour and one cup brown rice flour. Just found your siteand so glad i did.We have a grandson who has autisum and i never get to do cookies and other holiday baking with him it looks like your site is going to be very helpful to me. Thank you very much for your comment, Beverly. It truly makes me happy and I hope you are able to find some recipes that you and your grandson really enjoy. This baking mix has been a great way for my dad, who had to go gluten free, to be able to enjoy his old favorites. Many of them are eaten by people who can eat gluten and they never know the difference! I have some other recipes which I have formulated to be gluten free by using alternate flours like almond or coconut. The shortcake recipe is one that I really like and keep meaning to make into a cookie. You could experiment with that one by adding chocolate chips, raisin, nuts, etc. I also have a favorite cinnamon oatmeal raisin cookie that is delicious, using this mix, which I would be happy to share. I hope this helps! What would be the carb count on this flour blend? Also carb count on cottage pancakes. Thanks! I do not currently provide nutritional information but people have reported liking several online apps such as calorie count.about.com and myfitnesspal.com. I hope that helps! Thanks so much for including GF recipes on your beautiful site, I struggle to cook GF due to being allergic and still have it taste good. It is tough because there is gluten and wheat in almost everything. You are very welcome, Jamie, and I am glad you found me! This baking mix has been a saving grace to my dad. I have been able to cook his old favorites using a cup-for-cup substitution. No one ever knows the difference! Someone recently told me that her gluten-free mother entered a recipe contest with baked goods using this very mix. One of her recipes even won a prize in a regular category (as opposed to the GF category)! I do have other recipes that are naturally gluten-free and some that use alternative flours such as almond and coconut flour. So, look around and I hope you find some things to try! rice flour with Sorghum flour, also. That is one flour I have yet to add to the stash in my pantry, Mary Ann. Thank you for the suggestion! Will this work for like fried chicken and fried fish? Frying is an application for which I have not used this blend. I think it might very well work, although I can’t say with certainly. If you try, please report back! Will do! It will be probably a month or so before I try, I want to use up all my wheat flour before I go and start buy other flours. I was also going to try it in making cheese sauce for home made mac ‘n cheese. Whenever you get to it, feel free to report back. I use this blend mostly for baking, so any time someone uses it for something different, I am happy for the feedback to be shared. It is so helpful for people to have a worthy substitute for wheat flour when needed! Thank you for posting this, I have not been diagnosed as needing to avoid wheat, however every time I eat something that has been made with wheat flour I find I need to constantly clear my throat the rest of the day. Anxious to try this in my baking, bless you. I am so glad you found this and I truly hope it helps, Bernette. Thank you for taking the time to let me know, and feel free to let me know how it works for you! Great recipe………made some changes to drop the carbs a bit and it turned out great….here is a moderated approach….1: use weight over volume for the cottage cheese. 2: sub the 1/2 cup flour with a nearly full 1/2 cup of almond meal rounded off with 2 tablespoons gf oat flour and 1/4 tsp zanthan gum. Process in food processor. Came out great. Thanks for the feedback, Lynn. Based on the comments, I can tell this is directed toward the Cottage Pancakes although, for some reason, it is posting on the GF flour blend page. If you see this reply, please feel free to note the consistency of the pancakes with the almond flour, as I have not tried that as a substitute. Were they light and fluffy or a little flatter and denser? I am sure many other people who look at that recipe would love to read the details with regard to your substitutions. Thanks again! I am so glad I found this! My Mom and brother can’t have gluten! This is great–now I can share with them and bake more. Thank you so very much! I am so glad you found this, too, Kris! This mix has been so helpful in our family. I hope your brother and mom especially enjoy it! So loving this site right about now! I am a low carb gal who has used Brown rice flour when frying chicken. It works great. Just season the BR flour with your favorite season and dip the chicken into the egg wash and coat in the BR flour. Fry on a med heat until done and golden brown. My family didn’t notice a difference. Cast iron skillet works best,,,yeah I am a Southern gal! Thanks, Nicole, both for the thoughtful comment and the great tip! Your blend is almost identical to mine! I as well use mine in place of regular all purpose flour in everything and it just bakes up perfect. If I want a hearty or wheat-y flavor in something, I add in some sweet sorghum flour to the blend. If for some reason the blend ends up too starchy I add in some garbanzo bean flour (which smells horrible, but man does it make for some awesome cookies). Its smell disappears when you bake with it and gives a rich flavor and creamy texture. It really is amazing how well this stands in for all-purpose flour. Thanks for your great comment, Lauryn. I have yet to add sorghum or garbanzo flour to my mix but have thought about it. Perhaps I should try! Have you tried using corn tacos for a GF version? How do you use the tacos, Pam? Thank you for the gluten free options. After 50 years of marriage my husband was diagnosed with celiac disease. A few months later, my daughter was as well. You can imagine how my cooking and baking has changed. Love your web site and newspaper recipes. Keep those gluten free options coming! Hi Susan, Nothing like a celiac diagnosis (or two) to shake things up in the kitchen after 50 years of marriage! Over the years, I have found really good substitutes for most things, so feel free to reach out if you ever have a specific question with which I may be able to help. In just a short time, I bet everyone will be eating well and feeling great…and the new approach will feel like second nature to you! I just found this site and am very interested in your GF flour blend. You state that you use this for all your baking, but don’t mention yeast bread. Have you tried this for something like French baguettes or Sour Dough bread? Thanks for the recipes. I’ve recently been pushed towards a GF lifestyle and am doing my research. Hi Ray, I love this for most all baking applications – cakes, muffins, cookies, quick breads, etc. – but the one area it doesn’t match all-purpose flour is with yeasted breads. I’ve made pizza crusts with it and they are pretty good, but I actually prefer the the pizza crust recipe on this site that’s specifically designed to be gluten-free. I hope that helps! Did you ever use this flour for shoe-fly-pie? I’ve used this for so many things, Betty, but not shoo-fly pie. Realistically, the two areas where I don’t think this blend truly shines is in yeasted breads and pie crusts. I’ve tried but prefer recipes that are specifically designed for them. It works well for thickening fillings and would work for the crumb topping in shoo-fly pie. For the actual crust, this recipe is the best I’ve come up with so far: https://fountainavenuekitchen.com/almond-flour-pie-crust-gluten-free/. I hope this helps!